Fishermen, Boats, Chefs and Lobster! 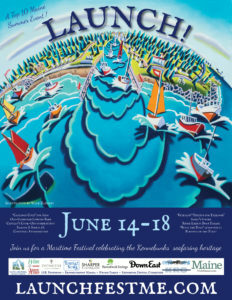 We’re celebrating all things nautical at Kennebunkport’s maritime Festival. Festivities kick off June 14th, 2017 for five days and is full of fun things to see and do every day. We’re launching events with the Fishing for Freedom for Wounded Warriors on Wednesday, June 14th. Support our wounded veterans by sending them off for a day of fishing. Held from 10:00 – 10:30am at the Colony Beach on Ocean Avenue. The Captains Cook-off at the Waterhouse Center in Kennebunk offers local chefs the chance to compete, turning Maine ingredients into gourmet dishes. Only one will be crowned the winner! Amateur, professional and kid chefs also have the opportunity to enter their own pre-made blueberry or chowder dishes to win prizes too! This event is held on Saturday, June 17th from 11am – 1pm. The Classic Maine Lobter Bake will be held on Saturday, June 17th from 4 – 7pm at the Pilot House in Kennebunk’s Lower Village. Dine on Maine staples of freshly steamed lobster, corn, pasta salad and blueberry pie while enjoying the busy river front scene and live music. Cost are $25 for the lobster dinner, $15 for those who don’t want the seafood, and $10 for the kids meal. There’s a number of events dedicated to the history of shipbuilding and the origins of this beautiful Maine coastal area. The Kennebunkport Historical Society will be leading walking tours. These tours are only 45 minutes long and take you through the historic Kennebunkport downtown area. Throughout the Festival, costumed storytellers will be on had in locations in Kennebunk and Kennebunkport. They will take you back in time through stories and tales. For shoppers, the Crafts on the River will be held on Saturday from 10am to 4pm on the lawn of the White Columns in Kennebunkport. There’s also a Retail Treasure Hunt each day from 10am – 4pm. Pickup a treasure map that highlights local shops. Collect stickers from each and enter completed maps into a drawing for prizes. Kennebunkport has long been known as a drinking village with a fishing problem by the locals! 🙂 If you enjoy a good party, we’ve got several of those too. The Rock the Boat After Party will be held on Saturday from 8pm – 11pm on the Spirit of Massachusetts. This special VIP party will feature live music, champagne, small bites and cocktails at the cash bar. Tickets are limited so buy them early if you want to attend this one! The River Lights Parade at Federal Jacks is also on the Saturday from 8pm – 10pm and is the perfect place to watch the River Lights Parade. 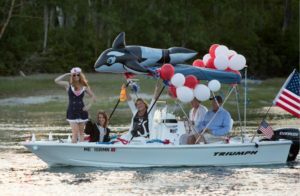 This boat parade on the Kennebunk River includes lobster boats, privately owned motor boats, paddle boats and maybe even the odd kayak or two. All will be decked out in sparkling lights and decorations. The Festival ends on Sunday with a seafaring tradition of Blessing the Fleet on the Pier in Cape Porpoise. Join the Rev. Charles Whiston for the ceremony at 9am. For more information on all of the events, click here. If you enjoy seafood, history and all things nautical, this is a great event for you! This entry was posted in Food, Historic Kennebunkport, Local Information by 1802House. Bookmark the permalink.